Bosch CCS 1000 D Digital Discussion System The CCS 1000 D Digital Discussion System is compact, easy-to-set-up, and easy-to-use. Yet it provides advanced features and exceptional versatility. Designed especially for quick, plug-and-play installation, it is ideal for small-to-medium-scale fixed meet..
Bosch CCS-CU Control Unit for CCS 900 Ultro Conference SystemBosch CCS-CU Control Unit is the central power and control station for all CCS 900 Ultro Conference System contributor units, such as the chairman and delegate units. The control unit will supply power for up to 50 delegate / chairman unit..
Bosch CCS-CUD Control Unit for CCS 900 Ultro Conference SystemBosch CCS-CUD Control Unit is the central power and control station for all CCS 900 Ultro Conference System contributor units, such as the chairman and delegate units. The control unit will supply power for up to 50 delegate / chairman un..
Audiocore WCM-6440U Wireless (4 Mic UHF PLL up to 512 Mic)The Audiocore WCM-6440 is built using the latest technology for Wireless Conference System, with high end wireless modules and phase lock-up frequency to ensure the clarity of the signal and interference-free audio. This product is suitable t..
Audiocore WCM-1080V Wireless (8 Mic VHF up to 16 Mic)Audiocore WCM-1080V (Wireless Conference Microphone Series) is a locked-in eight-channel VHF wireless conference microphone set with a high sensitivity, wide frequency response resulting to a good and stable performance and simple to operate.This ..
Audiocore CCS-500M Premium Conference System (Master Control Unit)Suited for the Audiocore CCS-500 conference mic series, this Master Control Unit is able to power up all the cabled conference microphone attached to it up to 60 mic. 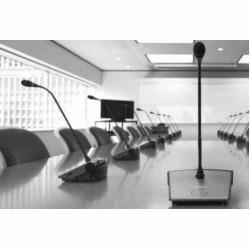 You can set it up in a daisy chain fashion to an extender machine f..
Audiocore CCS-500C Premium Chairman Conference Mic for CCS-500/CCS-100 SeriesOptimized for the Audiocore CCS-500 series, this Chairman Mic have the feature to mute all delegates at a touch of a button. This mic can be connected to Audiocore CCS-100 series as well.Technical SpecificationsConference C..
Audiocore CCS-100M Conference System (Master Control Unit)Suited for the Audiocore CCS-100 conference mic series, this Master Control Unit is able to power up all the cabled conference microphone attached to it up to 60 mic. You can set it up in a daisy chain fashion to an extender machine for added..
Audiocore CCS-100C Chairman Conference Mic for CCS-100/CCS-500 SeriesOptimized for the Audiocore CCS-100 series, this Chairman Mic have the feature to mute all delegates at a touch of a button. This mic can be connected to Audiocore CCS-500 series as well.Technical SpecificationsConference Chairman ..
Sistem Konferensi/Meeting/Rapat Kabel Premium Audiocore CCS-500Apapun acara dan kegiatannya, baik itu rapat sederhana di kantor, konferensi pers, training atau seminar, ruangan kelas, ataupun kebutuhan skala besar seperti untuk mic dewan di pemerintahan, sistem konferensi premium Audiocore CCS-500 d..
Sistem Konferensi/Meeting/Rapat Kabel Audiocore CCS-100Rapat, konferensi pers, dan seminar adalah bagian dari kegiatan sehari-hari dalam usaha dan kantor. Di kesibukan kita jaman sekarang, kita sering harus berlari dari satu pertemuan ke pertemuan lain, dari satu seminar ke rapat lain. Semua kegiata..
Bosch CCS Chairman Unit for the CCS 900 Conference SystemBosch CCS Chairman Unit is intended for use with the Bosch CCS 900 Conference System. Much like the Delegate Unit, The Chairman Unit features a built-in speaker and an adjustable gooseneck microphone. The Chairman Unit provides added muting co..
KREZT MC 663 SeriesMain Machine Specification :Power supply : AC220V+10% 50HzFrequency respons : 20Hz-20KHzImpedance output : REC : 200 ohm ; LINE : 200 ohmImpedance input : LINE : 50K ohmPB-in : 50K ohmS/N : 78dB (1KHz THD 1%)Dimension : 485*220*50mmChairman and Delegate Specification :Speaker : 8 ..
Krezt DCS-880 Conference System Microphone Krezt DCS 880 audio discussing conference system. The unit is made of central processing unit DCS 880MN, preside DCS 880CN and delegate DCS 880DN. The whole unit is conveniently operated, easily connected and strongly controlled.This unique conference ..
Krezt MC-4U Wireless Discussion MicrophoneSpecification :Frequency range : 740-790MHzModulation mode : FMAudio response : 50-18KHzAdjust range : 50MHzChannel : 200 channelChannel spacing : 250KHzFrequency stability : ±0.005%Dynamic range : 100dBMax modulation range : ±45KHzS/N rate : >105dBT.H.D ..
Bosch DCN‑WD‑D Wireless Discussion UnitUsed as delegate or chairman unitChannel selector with number and abbreviated channel nameFive voting buttonsSeparate battery pack, easy to change and chargeAdvanced power saving techniquesLow susceptibility to electromagnetic interferenceAuto microphone-offAut..